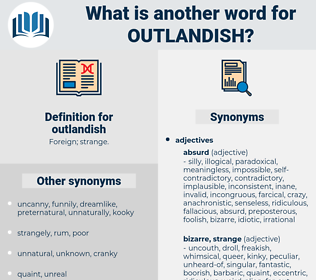 What is another word for outlandish? standard, ordinary, regular, normal, conventional, usual, nice, sensible, common, reasonable, Familiar, plain. unromantic, elegant, urban, conservative, cultured, run-of-the-mill, polished, routine, customary, refined, unremarkable, predictable, unglamorous, polite, well-bred, urbane, wonted, expected, habitual, frequent, garden, typical, commonplace, unexceptional, conformist, accomplished, average. We're going to get out of this outlandish place right away. The Rev'rund was buried at his mission in some outlandish place.